QDrive Driving School offer driving crash courses throughout Birmingham, Solihull, Redditch, Peterborough and Cambridgeshire. We agree a set number of days to organise between 3 and 8 hours of lessons per day so that you can learn to drive in less than 2 weeks in Birmingham and Peterborough. Our qualified instructors will also be on hand to take you in on test at the end of the course. If you need help to pass your Theory test we can provide online training materials for you to use free of charge. And if you've got a test of your own already booked, we can arrange a course with accommodation and make the travel arrangements on your behalf. 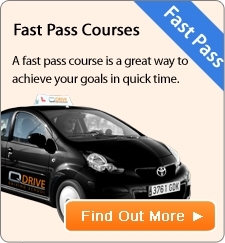 Our FastPass residential course may suit you best if you have already passed your theory test and need to take your driving test quickly even if there is a long waiting period at your local test centre! If you are willing to travel we are able to book tests within 14 days in some parts of the country and we'll make the necessary arrangements for you, although any additional cost for travel and accommodation will need to be met by you. Making the right choice is hard, so we've created a Course Calculator to help you. Our Calculator will; check prices and availability in Birmingham and Peterborough and present your options. Exact details will depend on the answers you give and the choices you make, and everything will be subject to your deposit being paid to reserve the course. Once you have selected a course, you can pay a deposit, and then the course will be booked for you.